It’s not surprising that Dialpad is the Business VoIP software of choice for mammoth companies like Uber, Quora and the Financial Times. This up-and-coming tech firm has landed on the scene over the past few years in a big way and is one of the most cutting-edge options in the market today. 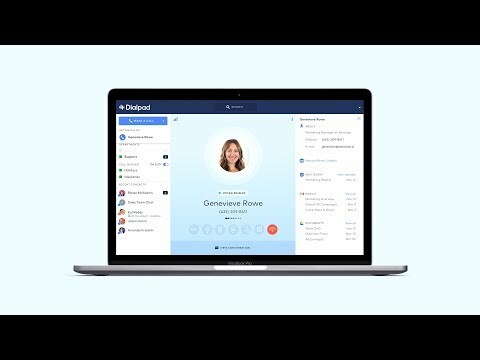 Dialpad is like the younger, cooler alternative to older firms like RingCentral and Nextiva who’ve been around for more than a decade. Established officially in 2014 but with roots in the tech industry long before then, the company combines a lot of expertise with innovation, offering one of the most impressive, modern VoIP services around today. You’re definitely going to love this firm if you love the most up-to-date technology on all of your devices. Dialpad has some very affordable payment plans, meaning whether you’re a new startup with only a few staff or a multinational conglomerate, you’ll find something to suit your budget without sacrificing your business needs. Firstly, it’s worth noting that anyone can try a one-month free trial, with no obligations to continue the subscription should you not be satisfied with the service you’ve received. UberConference Free: $0/month per user. UberConference Business: $0/month per user. Whether you’re a start-up, small or medium enterprise or a bigger firm, Dialpad prides itself on being easy to set up, and ready to go when you are. Director of IT at Quora said that all in all, the setup process for their offices took less than 24 hours. You can run the software across all platforms, including all smartphones and tablets, including iOS, Android and Windows. The website is a little ambiguous about extra hardware costs or installation costs you might have to front though, which is something worth checking before you go through with the subscription. Depending on your package, you’ll either have 24/5 or 24/7 support, so if you have any issue setting this up then customer support staff will be on hand to answer any queries you might have. Phone – You must have an account to access any customer service numbers, as these numbers are different depending on your package. Email – You must have an account to access the email addresses for the customer support term, as again, they’re different depending on your package. Live chat – Not available for any customers. You can find further guides, topics and users review through the help centre. Support isn’t available round-the-clock for every customer. Depending on your package and subscription type, you’ll either receive support 24/5 or 24/7 from the customer service team. All in all, Dialpad is a really innovative, modern and cutting-edge business VoIP service that will scale with your business, whether you’re a small start-up or a much bigger, international firm. While the website could be a bit more detailed, with more information about potential hidden setup costs or a telephone number that is available to everyone, they more than make up for this with their big-name clients and market-leading technological innovations. We’re rating Dialpad a ⅘ – it’s definitely one of the better market options but just keep an eye out that you’ve got the full information and terms and conditions about your package, whichever one you choose.